The true gift of this trip is the remarkable scenery, which the traveler may view from atop the towering cliffs and plummeting waterfalls. But even though surrounded by mountains, the Australian climate allows for beautiful gardens and wildlife. Visit Mt. Victoria, and peruse the craft and antique shops nearby. Walk through the secluded canyons and explore the caves in the area. Hike past the beautiful rhododendron gardens, which turn a deep crimson in the spring. See the panoramic view from atop the cliffs. Watch water plummet down towards the earth in huge cascading waterfalls. Take an exhilarating ride on the Scenic Railway. Afterwards, climb through a cool rainforest gully. 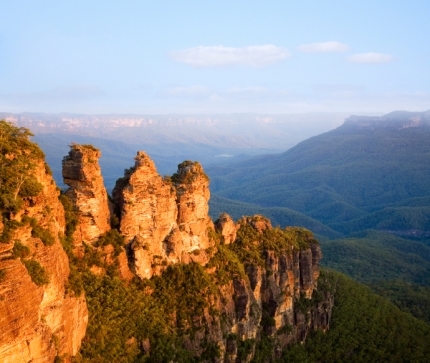 Walk past the famous Three Sisters. Take an absolutely remarkable mid-cliff walk, before going back to a very charming town. There, take some time to relax, and take part in the various activities. Shop at the little stores in the area, and be sure to bring your camera – you’ll need it. This trip is paradise for anyone who can appreciate this incredibly diverse country.